The Great Pyrenees didn't get its name for nothing—this giant breed looks imposing. Though he is large, the calm, composed Pyr is a loyal breed with an ingrained desire to protect small animals, children, and his family. And though he's not the best listener—he has more important things to do—he is highly intelligent. Great Pyrenees have been used to watch over flocks of sheep for centuries. They were bred to make decisions without a person, and their self-assured, strong-willed nature has stuck around. This is a serious breed that benefits from having a job or he may find his own, or become destructive. The Great Pyrenees may be referred to as Pyr and is known as the Pyrenean Mountain Dog outside of North America. Coat - The Great Pyrenees has a weather-resistant double coat that consists of a thick, coarse overcoat over a wooly undercoat. The white coat may have some coloring around the face. The hair on the face and ears is shorter and finer than the rest of the coat. The hardy Great Pyrenees has been used for centuries as a shepherd's dog in the Pyrenees Mountains of France and Spain. The earliest ancestors of the Pyr may have originated in Asia Minor thousands of years ago and before their introduction to Spain around 3000 B.C. Fossils from the Bronze age show what is thought to be the remains of the ancestors of the modern Great Pyrenees. The primary use for the Great Pyr historically was as a caretaker for livestock, but their majestic appearance and usefulness earned them the title of the Royal Dog of France in the early 15th century, contributing to the breed's popularity among royalty and nobility. Their reach extended to Newfoundland, and they are credited for the development of the Landseer Newfoundland. Pyrs were also used to redevelop the St. Bernard in Switzerland, before the Pyr itself needed saving from extinction due to improper breeding practices and dwindling numbers after World War I. Great Pyrenees made their way to the United States in the 1930s when a couple imported some to Massachusetts. This may have saved the breed from extinction, as World War II brought the importation of dogs and breeding programs to a halt. The current breed standard for the Great Pyrenees was adopted by the American Kennel Club (AKC) in 1933. The loyal, devoted Great Pyrenees is gentle and affectionate with family, but may be suspicious of new people. He needs a job to do, whether it's guarding livestock, nannying the children, or pulling a cart. A job gives the Pyr a sense of purpose, and he completes his duty with pride. Great Pyrenees are steady, even-tempered dogs who are highly intelligent, but they may be difficult to train, as they were bred to think for themselves and they're not fond of being told what to do. They try to assert dominance, so they need someone who will take the lead without question to prevent a pushy, ill-behaved dog. They may be difficult for first-time dog owners who aren't willing to put the effort into training them. Are Great Pyrenees Good with Kids? Great Pyrenees are fond of children, and when given the appropriate training will do well with kids of all ages. Great Pyrs protect children and will likely follow them around to ensure their safety. 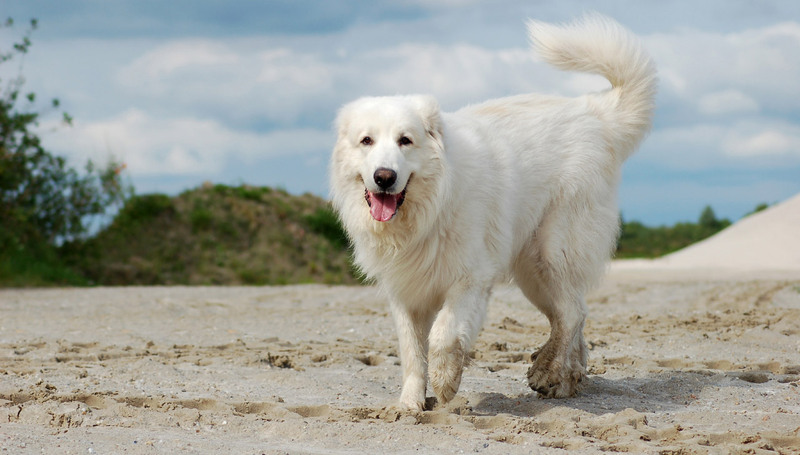 Though the breed is large and sturdy, children should never be allowed to climb or ride on a Great Pyrenees or any other breed, as it may injure the dog or instigate a bite. Are Great Pyrenees Good with Other Pets? Great Pyrenees tend to do well with other animals when they're raised with them and properly socialized. It is important to start socializing them with other animals from puppyhood to ensure polite behavior as an adult. The Great Pyrenees—bred as a protector of livestock and home—makes a fantastic watchdog and is likely to alert owners to the approach of strangers. They are not aggressive by nature, but possess the drive to protect family from threats. Early, continued socialization is important to help the Great Pyr understand the difference between something new and something threatening. While energetic, with enough exercise, the Great Pyrenees is a calm companion indoors. A Pyr with enough exercise and attention is likely to curl up on the softest bed in the house to doze the day away. The Great Pyrenees is likely to bark at sights and sounds, or just because. He needs early—and continued—training and socialization. He is large and powerful. He needs an experienced dog owner or someone willing to put time and effort into training. Though intelligent, the Pyr is stubborn and difficult to train. He needs a job to do. Indoor Though large, Great Pyrenees don't need an excess of space. They enjoy snoozing on giant dog beds or comfortable furniture, and don't tend to be rambunctious while inside. They're not ideal for apartments as they can be loud—they bark to warn you of any sight, sound, or smell they notice—but they don't need a large home or yard to be happy. What they do need is a job—without one the Pyr may become destructive. Outdoor Friendly, calm, and devoted—Great Pyrenees are made to live with people. They may be able to spend a portion of their time outdoors, but they prefer to be near people. They're not built for hot weather and should not be expected to spend time outdoors if it is hot. A fenced area is ideal as the independent Great Pyrenees may decide to wander. Exercise Though large and energetic, the Great Pyrenees doesn't need a huge amount of exercise. About 20 to 30 minutes per day may be enough exercise. Endurance Great Pyrenees were bred for the endurance necessary to properly guard their flock, and though they are energetic at times, they don't possess an incredible amount of stamina. A Pyr is made to charge a predator and chase it away, so bursts of energy are more his style—he uses his energy wisely, and is not likely to waste it. Great Pyrenees cannot handle strenuous exercise in hot or humid weather as they will overheat. Running Miles: Though energetic, the Great Pyr isn't an ideal running companion. He may be able to join in on short jogs. To prevent bone, joint, and ligament damage, this slow-growing dog should avoid excessive running until he is fully grown—at least 18 months. Hiking Miles: Great Pyrs enjoy hiking—especially in cool weather—but the trail may be off-limits in the summer as they may overheat. They enjoy taking on the task of carrying a pack. Food Though large, the Great Pyrenees eats less than you'd expect due to their slow metabolism. Too much food can cause undesirable weight gain. The general recommendation for how much high-quality dry dog food to feed is two to four cups per day. This amount is based on average weight and activity level. Food should be split between two or three meals, or can be offered in a food-dispensing puzzle toy. Great Pyrenees may suffer from gastric dilatation volvulus, or bloat. Small meals multiple times per day and limited exercise after feeding can help prevent the condition. Great Pyrenees do not tend to guard their food, but children should never be allowed to touch or remove food while any dog is eating. Alone Time Though attached to family, Great Pyrenees can handle being left alone for five to eight hours during the day—if given plenty of exercise and mental stimulation otherwise. Without activities to keep the Great Pyr entertained, he may become destructive and will howl or bark. He should not be left alone outdoors, as he is likely to roam. The long double coat of the Great Pyrenees sheds heavily, but isn't difficult to maintain. Weekly brushing will help keep the Pyr's coat and skin healthy and cut down on shedding, but the fur naturally sheds dirt and bathing is necessary only infrequently. Great Pyrenees should not be shaved as their fur is naturally cooling and protects them from sunburn. Daily brushing may be helpful during seasonal shedding of the undercoat. Trimming nails regularly will help prevent painful splitting, cracking, or breaking a nail. Regular ear cleaning can help prevent ear infections. Getting your puppy Pyr accustomed right away to handling for grooming will prevent difficulties when he is full grown. You can minimize serious health concerns in a Great Pyrenees by purchasing him from a reputable breeder who engages in responsible breeding practices, and through screening for common diseases and conditions. Though highly intelligent, Great Pyrenees can be a challenge to train. They were bred to make their own decisions, and it's a trait that has stuck around. They're strong-willed and stubborn, so establish yourself as the pack leader early on in training. They may become easily bored, so fun and varied training sessions are your best bet for the path to training a happy, well-behaved dog. Priorities in training should be socialization with people and animals, good behavior on leash, and working toward a solid emergency recall—Pyrs are known to wander, and often disappear if a leash slips or they get outside without one. A job is the greatest gift you can give a Great Pyrenees. They're thrilled to work—it's in their blood. Pyrs are great candidates for carting competitions, nosework, herding, and agility. Slow-and-steady is key when training for agility or other strenuous activity—growing bones and joints can be damaged if the proper considerations are not taken. While they take to competition well, obedience is not their strongest activity, as they prefer to think for themselves. Pyrenees also excel as therapy dogs because of their caring nature, and they enjoy visiting nursing homes and hospitals. While the Great Pyrenees has been used as a hunting dog in the past, the modern Pyr isn't a sporting dog. Aside from being likely to wander, they don't have the stamina for days spent in the field. And swimming may be difficult for many Great Pyrenees, so retrieving is not a likely task for this breed. What are 'Badger Marks' on a Great Pyrenees? While most people think of the Great Pyrenees as a pure white dog, the breed standard allows for up to a third of the coat be colored. Any color is accepted as long as it is within the allowed amount. Badger or blaireau coloring—a mixture of white, gray, brown, and black hairs—are the most common. Colored markings usually appear around the face and ears, as well as throughout the body. These markings may disappear as puppies grow, and may also reappear in adulthood. Do Great Pyrenees Have Extra Dewclaws? While most dogs only have one set of dewclaws— or extra toes—the breed standard for Great Pyrenees requires double dewclaws. The Pyr's double dewclaws were useful in navigating the tough terrain of the Pyrenees mountains while guarding the flock. They are for balance and grip while running, climbing, and turning. While it is possible for Pyr puppies to be born with a single set, the absence of double dewclaws is considered a fault in the ring. Should Great Pyrenees Be Shaved in Hot Weather? Shaving a Great Pyrenees—or any other double-coated breed—is not recommended. If they have access to fresh, cool water, air conditioning, and shade, they're not as hot as you think they are. Their double coat acts as insulation against the sun, and if you shave it they are less protected from heat and sunburn. Shaving the coat may also change the texture as it grows back, further removing the protection the coat is meant to provide. Hot weather can be battled with a kiddie pool full of water—but keep the clippers away from that gorgeous coat.